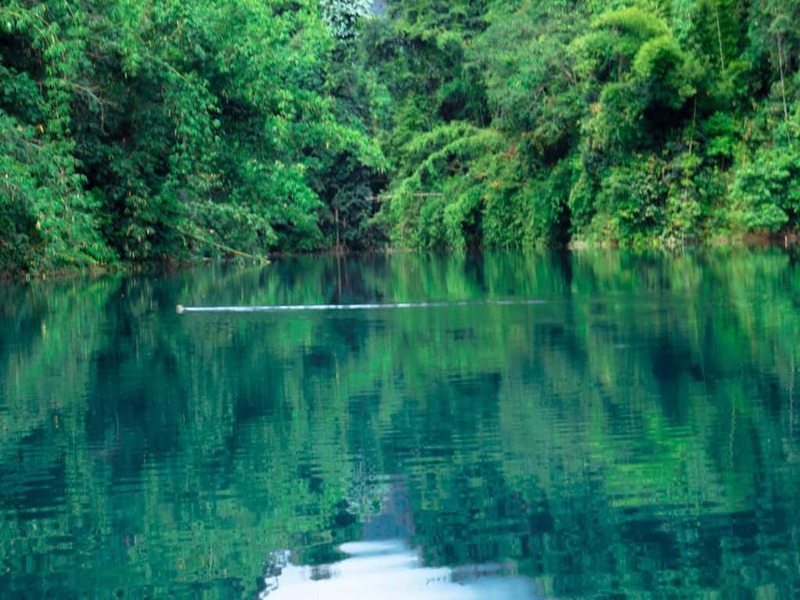 Oh, that gorgeous Khao Sok National Park lake. 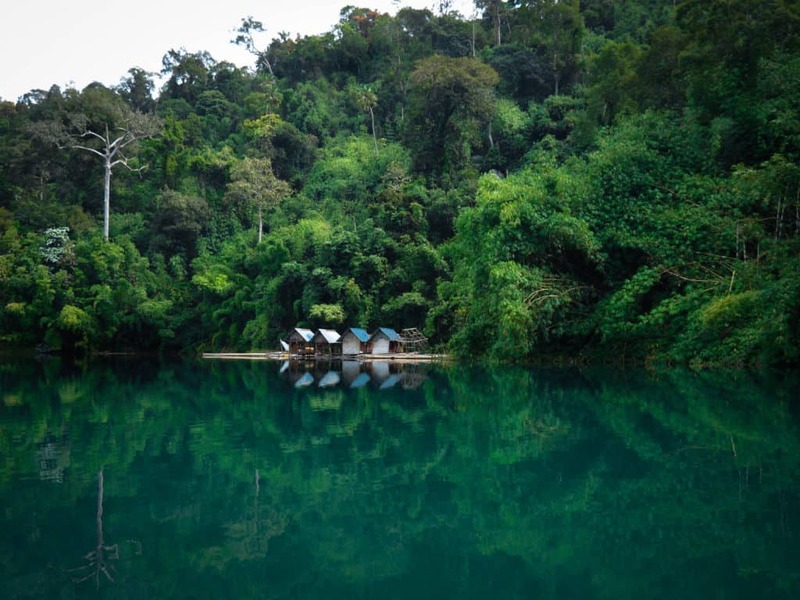 The picturesque man-made reservoir in Southern Thailand with iconic floating bungalows on emerald green waters surrounded by a lush rainforest. How excited were we to finally arrive at this magical spot! Being one of the less touristy places in Thailand, Khao Sok’s Cheow Lan lake provided a perfect change of pace and scenery from the busy beaches in Krabi and the islands. At the end of the day, spending a weekend on a lake is one of the more unique things to do in Thailand. 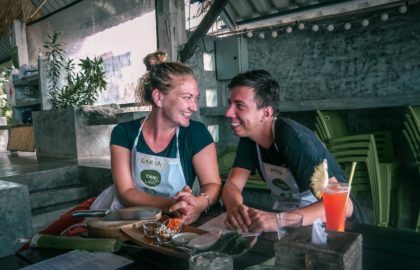 The premise of our entire backpacking Southeast Asia journey was that we would seek unique travel experiences and through that challenge ourselves and expand our worldview. As a result, we desperately wanted our Cheow Lan lake trip to be special, to be different, to be unexpected. And yet, as we soaked in the tropical rain and watched flames come out of our boat engine in the middle of a cobra infested lake, just five minutes after leaving the pier where the same boat was saved from sinking… *inhale* …we wanted nothing more than going back to boring and standard. 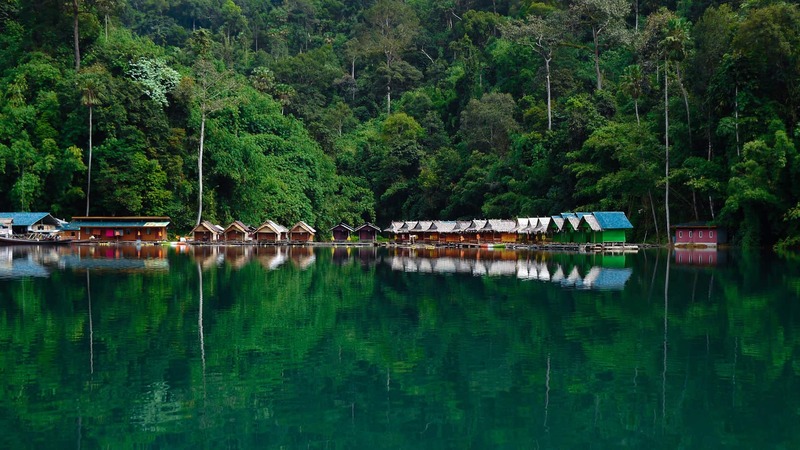 What's So Special About Khao Sok National Park? Wait, is Cheow Lan Lake Artificial? How to Get to Khao Sok National Park? What Can You Do in Khao Sok National Park? 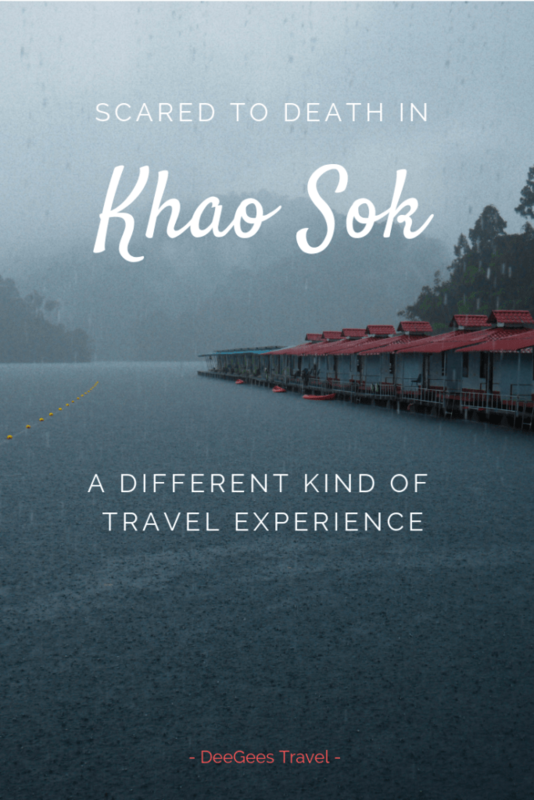 When to Visit Khao Sok? What to Pack for a Trip to Khao Sok Lake? How Long to Stay at Khao Sok National Park? Can You Visit Cheow Lan Lake or Khao Sok Independently? Where to Book an Organized Tour to Khao Sok National Park? Is It Dangerous at Khao Sok National Park? How Much Money to Budget for Cheow Lan Lake Trip? What is Included in Smiley's Cheow Lan Lake Trip? If this makes any sense, we were enjoying the beaches and the islands in Southern Thailand so much we knew we had to leave. These gorgeous beaches, the reason why Thailand is so popular, were making us increasingly lazy both physically and mentally. We were drifting away from the goal of our travels and felt like if we’d stay, we’d melt and inseparably fuse with the white sand on the shore. It was time to move on. 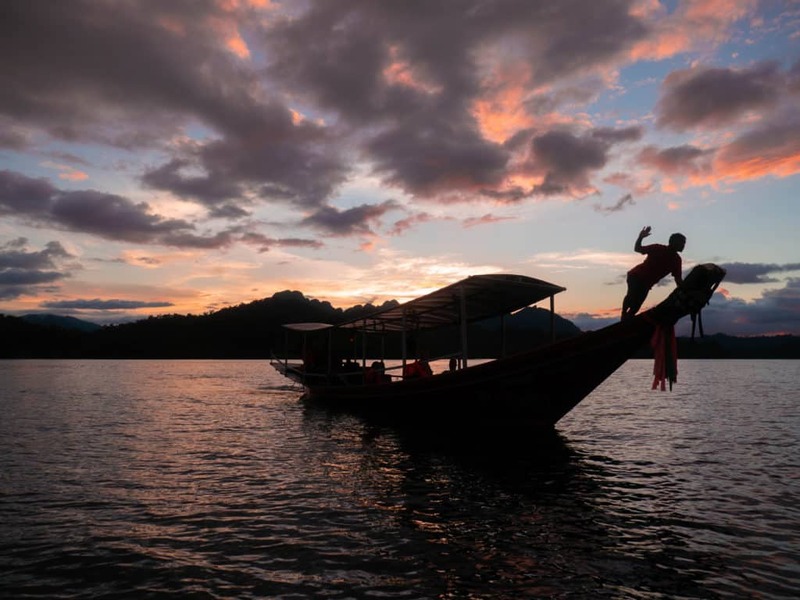 Our backpacking adventures were to continue on the much anticipated Cheow Lan lake trip – what is rumoured to be one of the most amazing places in Thailand. We arrived at the Khao Sok park from Krabi town on a sunny October afternoon, which is officially still in the midst of the heavier rain season. The sun was shining, the air was humid but refreshingly clean and there were no crowds of tourists to be seen. Awesome! Our Thailand tropical forest adventure was beginning in a very promising way. Although Khao Sok National Park lake was our ultimate destination, we have decided to spend the first two days in the middle of Thailand’s rainforest in Khlong Sok village and do some hiking. Not interested in long overnight treks this time, we opted for exploring Khao Sok independently. 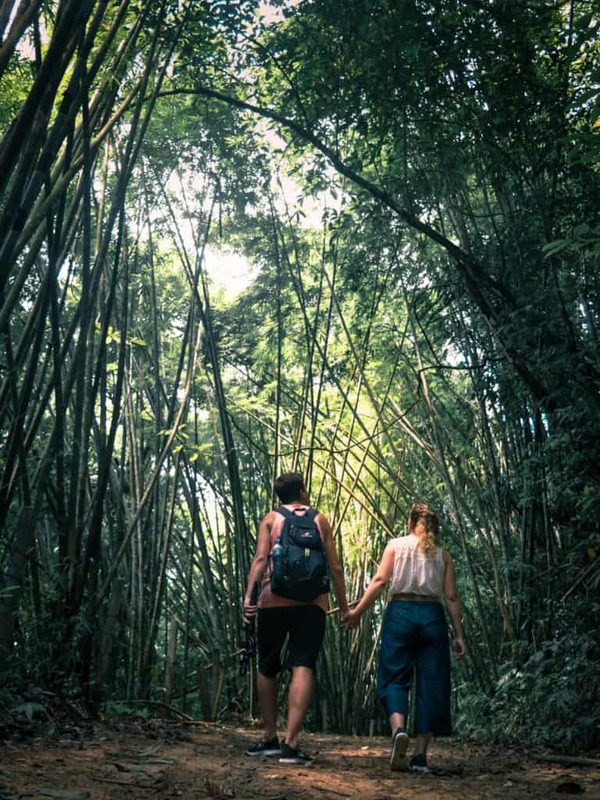 Chilled and slow-paced, we did a full day jungle hike finally stretching our legs, learning about the impressively diverse Khao Sok wildlife and simply enjoying the rich nature. There was almost nobody else hiking besides us on the trail! Overwhelmed with joy, we made a possibly premature resolution to always travel to places in rainy season. At 3 PM it started raining. Despite the park management’s and the hotel receptionist’s assurances, the rain didn’t stop until the late afternoon the following day. “Very unusual”, they said. Unique travel experience is what we asked for and seemingly it is exactly what we were getting. Not overly hopeful yet perhaps too stubborn, we took the risk of booking our overnight Cheow Lan lake trip at Smiley’s Bungalows and spent the rest of the day doing rain dances and praying to rain Gods. Eh, what do you know? The day of departure to the Khao Sok National Park lake we woke up to the bright sun shining through the window. Sunscreen packed. Floating bungalows, here we come! 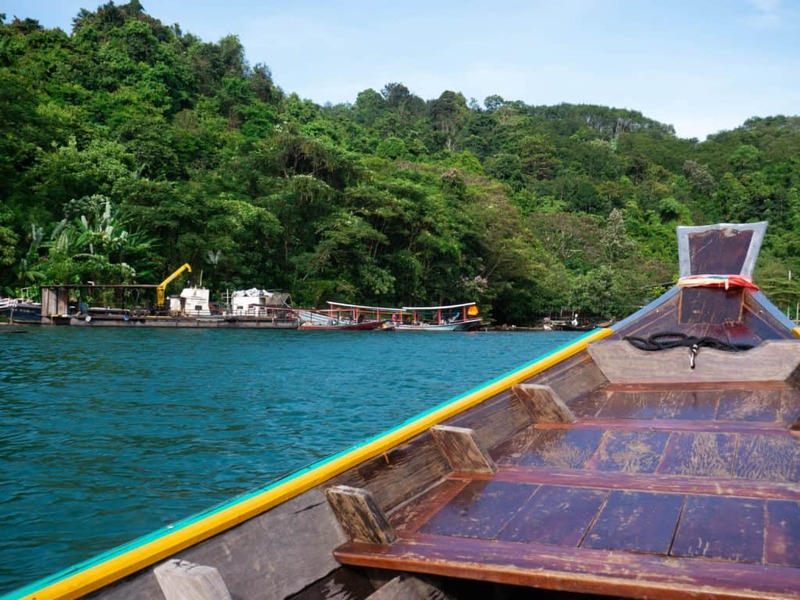 After a quick breakfast and an hour ride on a bus, we were sitting in a low longtail boat rushing through the gorgeously blue waters of Cheow Lan lake. We passed by proud limestone karsts and vividly colored green islands towards Thailand’s famous floating bungalows. The sun was shining brightly, the views were jaw-dropping yet we hardly saw any other boats on our way. This is what you get when you travel to the less touristy places in Thailand during low season. Upon arrival at the Smiley lake house we received an incredibly warm welcome. The property well deserves its name. You could clearly see the staff was happy to be working there, their positivity and upbeat mood infecting even the grumpiest of travellers. Although, to be fair, there were absolutely no reasons to be gloomy. The lake in front of us was so scenic it looked like a cutout from a fancy travel magazine. And if that wasn’t enough, as we arrived a rainbow stretched over the skies just in front of us. We almost expected wish-granting purple unicorns to appear next proving us it was just a dream. 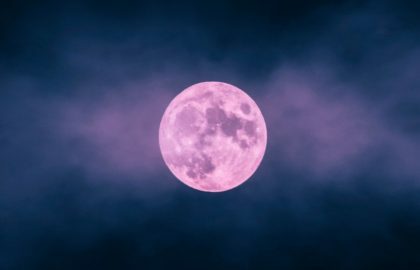 With the absence of magical creatures, we exhaled deeply letting all our anxieties and doubts fade away, laughing like kids still unable to believe our own luck. This has got to be one of the most amazing places in Thailand! Pure happiness. 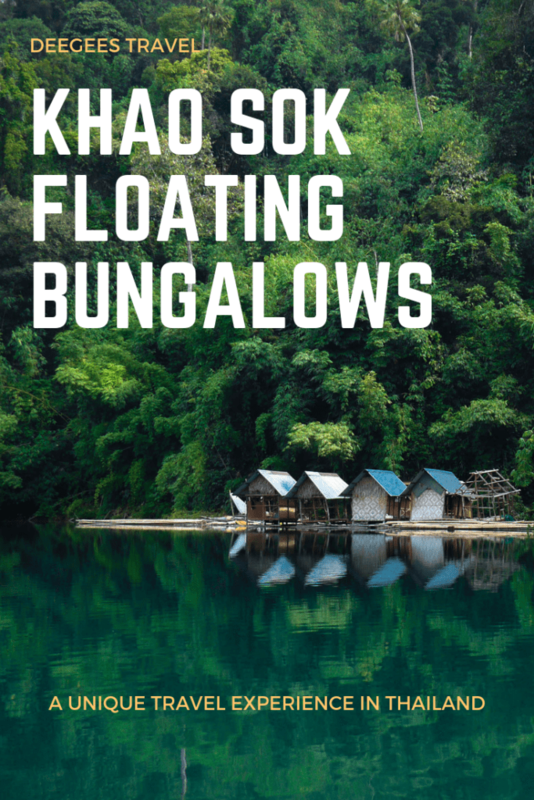 The floating bungalows we were accommodated at, were basic but romantically cozy.Not much more than a mattress on the floor in a wooden hut, their simplicity seemed appropriate and fitting to the two-day digital detox we were about to begin. Yes, not only was there no signal, in the entire bungalow complex there was also only one socket with a huge extension guests could use for a couple of hours in the evening. Laughing, we joked about what could one do in case of an emergency. How ironic we would come back to that thought in slightly less relaxed circumstances less than 24 hours later. But that’s later, now we were obliviously happy bathing in the sun. As our luck would have it, in the afternoon we were offered to visit Khao Sok waterfalls which are only accessible during the rainy season strictly under good weather conditions. Bingo - we had both. After a short boat ride our little group started the ascend through the cascades of waterfalls. Climbing rocks, walking across natural pools and balancing on tree roots, we made our way deeper into the rainforest. At the end of this invigorating journey, about 45 minutes later, we reached a two-three-meter-tall waterfall each of us could jump under to pose for enviable photos to send back home. It was fun. We probably could have and definitely would have, if given the opportunity, continued way further in the jungle, but as it was getting darker our guides decided it was time to return. That’s what you call “controlled doses of happiness intake”. The sun was already very low as we were on our way back to the Smiley’s lake house. Warm golden sun glow on everyone’s smiling faces was representative of the warm light feeling of content we felt inside. Total serenity. The picturesque sunset show was about to begin when our guides offered us to get into the lake to have an unusual perspective on the sun setting behind the cliffs. Wow, first row seats! 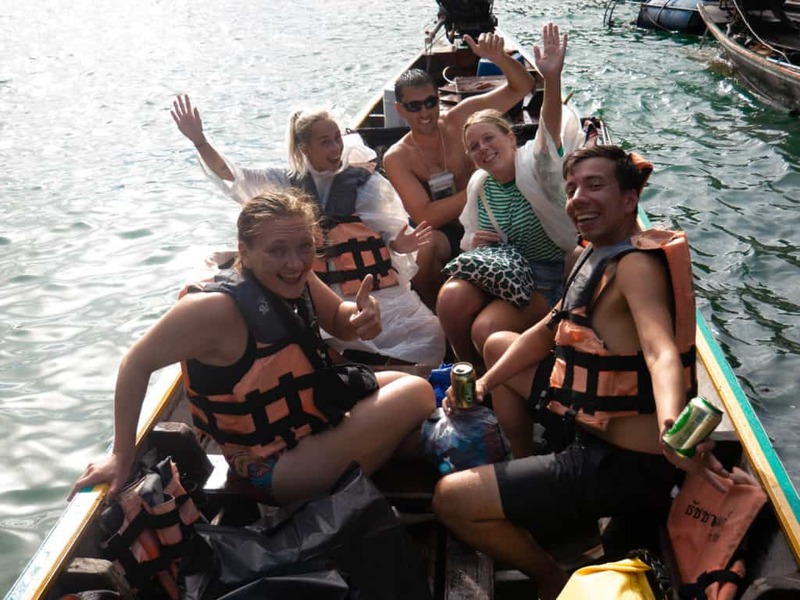 Just like kids we reluctantly put on life jackets our guides insisted on and hurriedly jumped into the deep waters of Cheow Lan lake. Just like teens just minutes later we rebelliously removed life jackets from our backs and put them between our legs (yeah, I guess you could say it looked like huge diapers from certain angles ;)). To our relief this seemed safe enough to our caretakers, so we could freely enjoy the warm and silky water on our back and shoulders. What more can one possibly wish for? We didn’t have a chance to finish this thought as another boat from our camp returned to check up on us. It must be a common thing to happen as teams from both boats jumped on what seemed to be a standard operating procedure to revive the engine. If it was meant to be some sort of a warning sign from above, we’d totally missed it. Instead, completely unalarmed we continued taking pictures of the gorgeous Khao Sok park sunset. The boat engine hiccup was quickly forgotten as we finished watching the sunset from the safety of our floating bungalow deck sharing a beer with fellow travellers. We were so happy our Cheow Lan lake trip was an overnight one – there were still so many things we wanted to do, we were not ready to leave. Already then we knew we would return here one day and spend more nights at the picturesque Khao Sok national park lake. For now though, we had to seize every single opportunity which arose. Carpe diem! Before the crack of dawn our alarm clock rang. It was 5:30 AM. Still sleepy, slightly grumpy, in a desperate need for a coffee but with no time to lose, we rushed onto the kayaks to peddle behind the bungalows to get a better view on the lake and the rising sun. Josh, the like-minded unique travel experience seeker we’d met the day before, joined us on our quest. Truly, one of the amazing side effects of travel is meeting fantastic people and sharing some unforgettable moments together. As we’d learned later, life had prepared a couple of even more memorable moments we were meant to share with him, but that’s later. Now we were on the little orange plastic kayaks making our way across Cheow Lan lake to watch the sunrise. The wind was rather unruly generating waves strong enough to keep us awake and alert, but mild enough to stop us from returning back in defeat. Conscious of keeping our balance, we peddled steadily onward. Of course we had our entire photography equipment with us, so falling in the lake was simply not an option. The morning turned out to be rather cloudy. Lit by the sun slowly rising behind, covered in a blanket of mist, limestone karsts surrounding the lake appeared serious and monumental. The water of the lake - dark and deep. 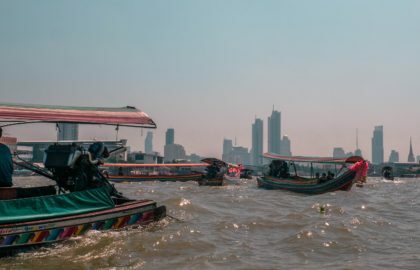 It was not the same lighthearted paradise we had experienced yesterday nor the bubbly Khao Sok national park lake we’d seen on the numerous YouTube videos. It was intimidating. We were slowly beginning to feel our own insignificance in the context of this majestic wild nature surrounding us. But it wasn’t scary. It was breathtaking. It was refreshing. As the sun continued to rise we could hear the entire Khao Sok wildlife wake up, we could feel the sun energy fill our bodies. We were fully awake now and smiling out of deep inner joy. Nothing beats a sunrise out in the nature. Before we had to leave Khao Sok National Park lake we were offered to go on one more morning safari boat ride and to hike a couple of kilometers to a nearby cave. The sky had cleared up and it was stunning. The sound of the morning jungle, or probably any forest for that matter, is something one has to experience at least once in a lifetime. The blend of tree and bush leaves caressing each other in the wind, bird and gibbon singing accompanied by the gentle sound of water hitting limestone karsts is a unique melody which will forever remain the soundtrack of our Cheow Lan lake trip. We may have not seen much of the Khao Sok wildlife animals, but there was one which left a lasting impression. As we approached one of the islands popular with gibbons, we saw a long creature rapidly crossing the waters of the Cheow Lan lake. We were told it was a snake. So big?! It looked more like a Loch Ness monster to be honest. We didn’t think much of it until days later when we went through our pictures. On the photos of the deck from which we jumped into the lake we noticed a massive snake. Massive. After some googling we found out it may very well have been king cobra - the biggest venomous snake in the world, a known inhabitant of the Khao Sok park. Yikes. The 3 km hike into the rainforest was the last and the most active thing we had done during our visit to Cheow Lan lake. Do not ever underestimate distances in a jungle. Three kilometers may be nothing on a straight city road, but in the wild nature it is something which can easily take up to one-and-a-half hours to complete. We were so happy for having our wet shoes as we were walking through the muddy paths and waist-deep waters. It was a really fun adventure. The cave had a small entrance and allowed for only seven people at a time to climb inside. Only ten minutes inside, it was completely enough to appreciate the natural formations while being chest-deep in a powerful water stream rushing through the cave. Not big cave fans here. Again and again we rejoiced over our chosen time of visit to the Khao Sok park. 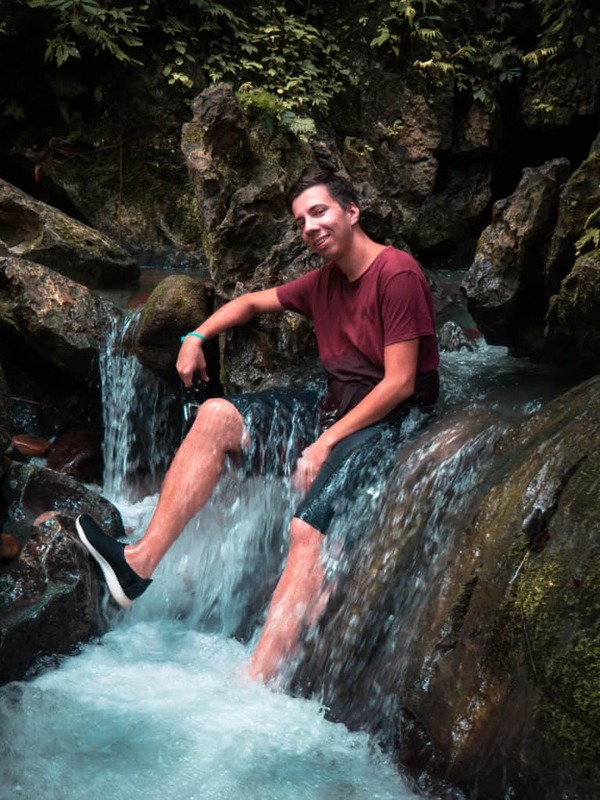 There was still water in the Khao Sok waterfalls and the naturally formed pools yet not too much of it so that we could actually get there to see all these beautiful spots. We felt like absolute winners for going to this stunning but one of the less touristy places Thailand! The little rain which sprinkled on our hike back to the boat didn’t change that perception. Neither did the stronger rain which forced us to put away cameras and phones into a dry bag. By the time we finally had to leave our floating bungalows a full-blown tropical thunderstorm with loud sound effects and bright lightning had started. But even that was romantically beautiful. That is, if we could enjoy observing the Khao Sok wildlife in the comfort of warm clothes under the roof. To our continuous cheering, our departure time was postponed a couple of times. As opposed to two Dutch girls who had to catch a flight later that evening, we were in no rush to leave. We could have easily extended our Khao Sok overnight lake tour by another night or two, but destiny had other plans. 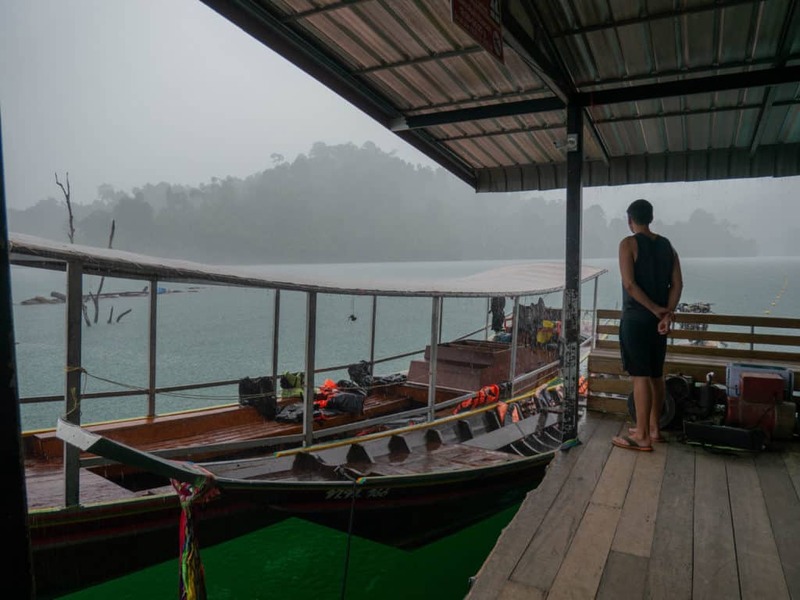 Probably afraid that we would never leave, the staff apologetically informed us we would shortly need to board the small wooden roof-less boat and start our journey back without waiting for the rain to stop. We thought it was a joke. They couldn’t possibly mean the boat the team had just saved from sinking after Josh noticed the water was about to reach the engine? The boat where the engine pumping out water was broken? In this rain?! We laughed. They laughed. As the awkward silence continued, it dawned on us they were serious. Over the past few months in the quest for unique travel experiences we have learned to push our comfort zone boundary very far. So far, sometimes I wonder where the edge of our comfort zone even is anymore. Not here. We changed into our swimwear, put our backpacks in huge plastic rubbish bins, grabbed a beer from the bar and climbed onto the boat. Using an umbrella on a moving boat in the tropical rain would not only have been absolutely useless, but also ridiculously difficult if not dangerous. We didn’t even bother with trying to cover ourselves. Instead, we decided to make the best out of this weird situation. We’re not made out of sugar, we’re not going to melt, right? Five minutes after we had left the bungalows the boat stopped and wouldn’t move anymore. A moment later fumes appeared from the rear of the boat. The captain didn’t look amused. Neither did any of us on the boat. Josh, who was sitting the closest to the captain leaned over. “Yup”, he said in an inexplicably calm way, “the engine is on fire. And yes, that’s a petrol barrel just next to it”. What?! We all broke into a nervous laughter being overwhelmed by a cocktail of emotions we were unable to digest. Frightened and confused, we grabbed tightly to our belongings. Would we need to jump? Can this actually explode? Do we jump before it explodes? How can we call somebody? What do we do now? If a moment ago we thought our newly established comfort zone boundaries could not be reached easily, I can guarantee you at this moment we were both way over them. David looked very serious as all of this was happening. As he later recalled, he was entertaining himself by imagining all possible ways we could die and then calculating their respective survival rate. On that list was anything from being torn to pieces from the explosion to being bitten by one of the king cobras irritated by the loud noises in the lake. Our chances didn’t look good. So here we were. Fearless explorers soaking in the tropical rain watching flames come out of our boat engine in the middle of the cobra infested Khao Sok National Park lake, just five minutes after leaving the deck where the same boat was saved from sinking, hoping for things to eventually go back to boring. Our Cheow Lan lake trip was turning out to be really different from our wildest expectations. But you know what? Although we were utterly scared, not for a second did we regret coming to the Khao Sok park. Eventually somebody from Smiley's heard our yells through the noise of rain and came to our rescue. Kind of. 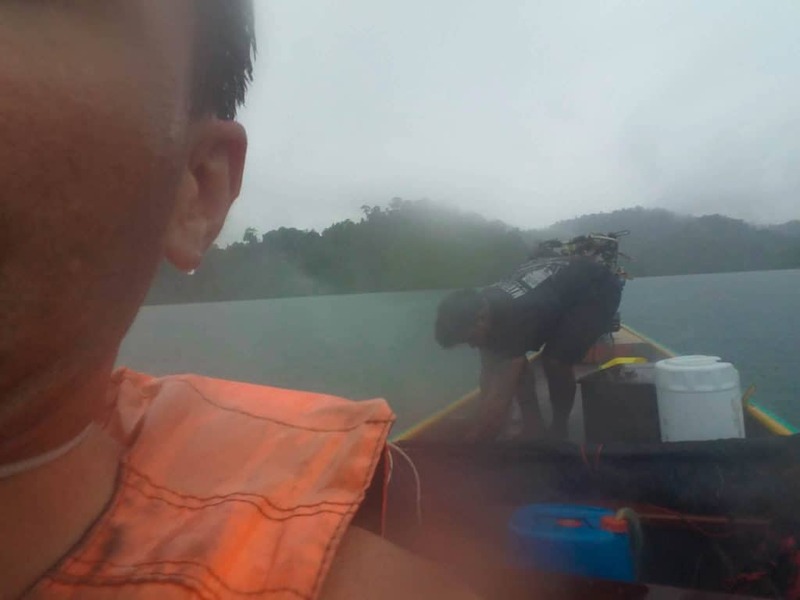 We were not-so-secretly hoping the boat would be irreparable and we would either need to spend another day at the Cheow Lan lake or change to a bit more reliable boat. None of that happened. Our pleading for a boat change was fruitless. Smiley’s staff smiled shyly and mumbled “sorry”. The skillful mechanics fixed the engine and said goodbye to us for the last time. It was time for us to go. On the hour ride back to town the boat engine stopped a couple of times, but the captain was able to fix it by himself. He looked on edge the entirety of this trip and didn’t even break a smile in response to the terrible and terribly loud singing we’d started to calm our nerves down. Later we’d find out it was his first day on the job. Poor fella. Maybe this was all just some sadistic on the job training? Like in a fairy-tale, at some point the rain stopped almost instantly and was replaced by an impossibly blue sky and the sun shining brightly. We didn’t even wonder so much about this peculiar weather change. At this point we were confident this was the beginning of the Happy End of our Cheow Lan lake trip story. Look. 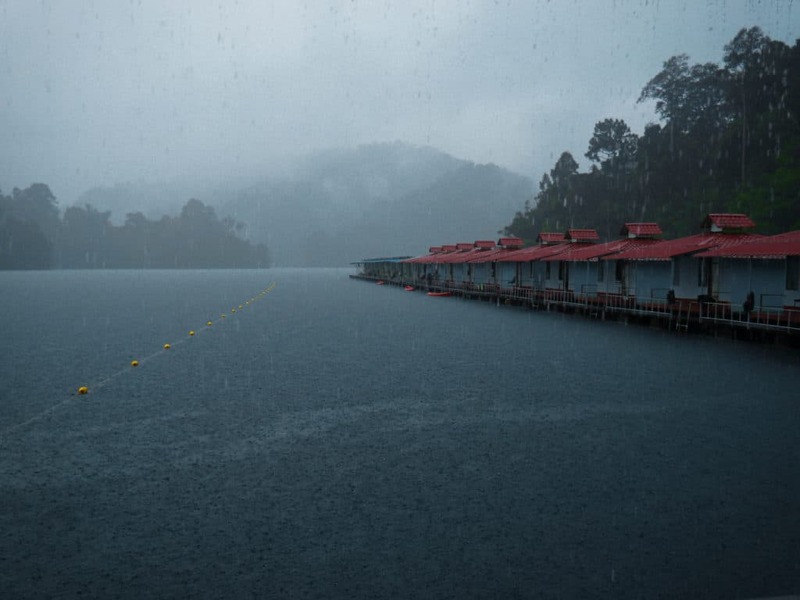 We know our Cheow Lan lake trip may come across a tad dramatic, especially towards the end. And yes, it was a bit nerve wracking and at times not entirely safe but it all balanced itself out against the unbelievably beautiful nature and the amazing experience. 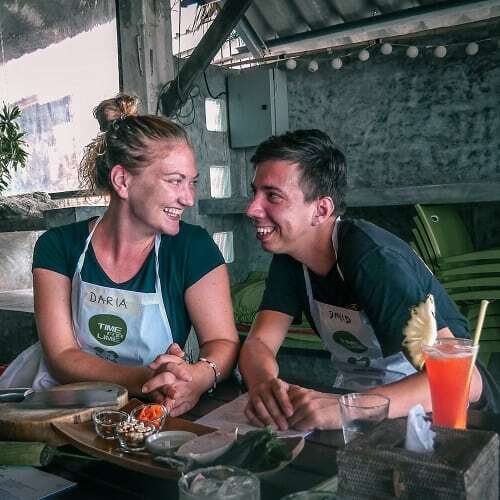 We can wholeheartedly recommend it to anybody looking for more unique things to do in Thailand. Bad things can happen anywhere, even if you don’t leave the comfort of your home. 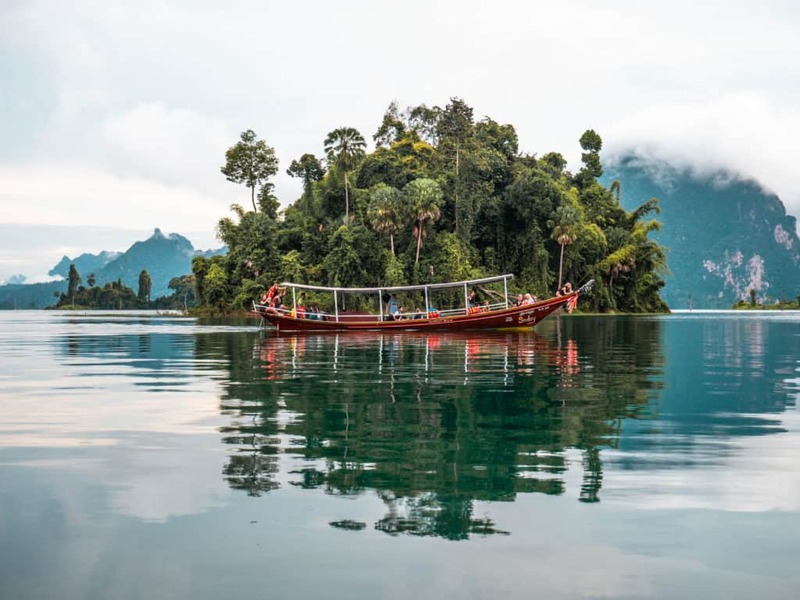 So don’t let some parts of this story discourage you from visiting Khao Sok National Park lake - definitely one the most amazing places in Thailand. Khao Sok National Park lies in the Southern Thailand's province of Surat Thani and is accessible from all popular destinations in the area (e.g. 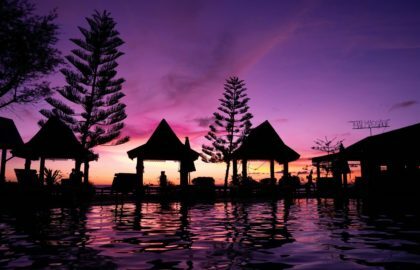 Phuket, Krabi, Koh Samui and Surat Thani). 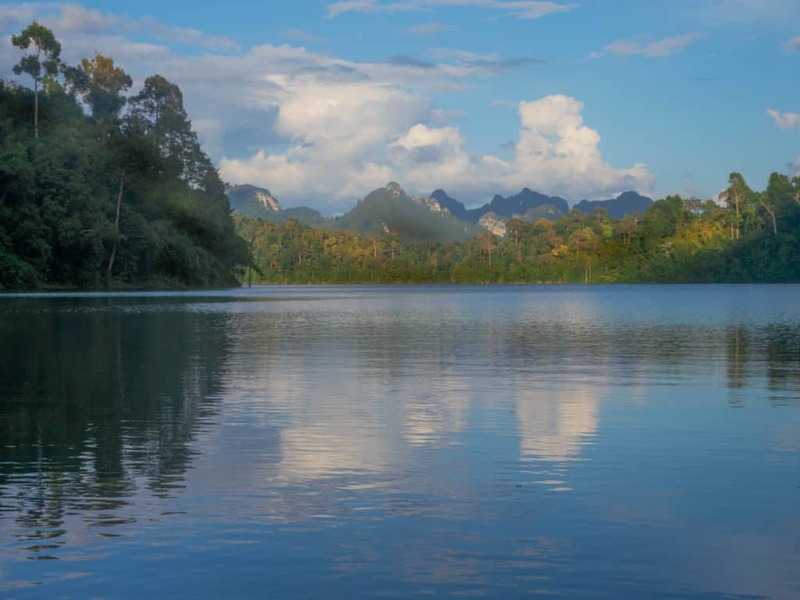 Where is Khao Sok National Park Lake? Khao Sok National Park lake or Cheow Lan lake or Cheow Larn lake is actually not directly at the village you will most probably be dropped off at if you travel to Khao Sok National Park (see map). You can either get your own transport to travel along route 401 or book one of the organized tours. Khao Sok is one of Thailand's untouched rainforests and hosts 5% of the entire world's wildlife. 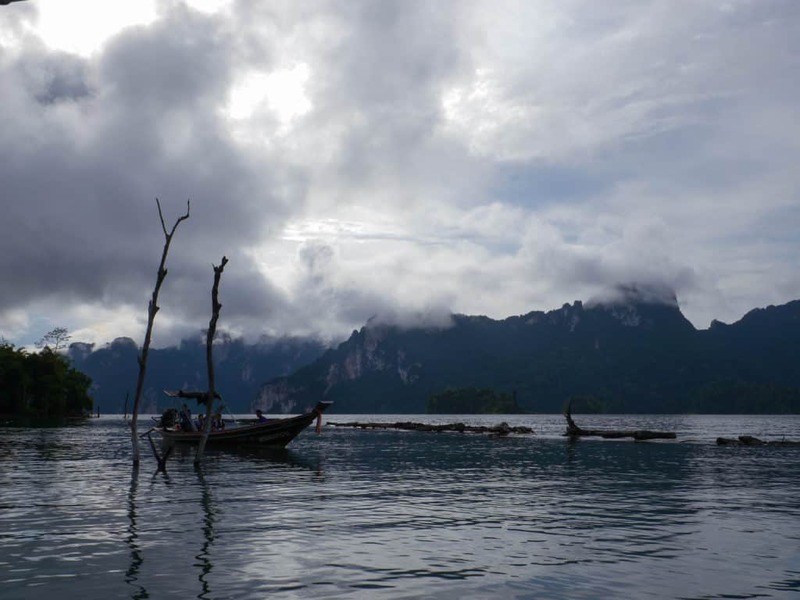 Khao Sok has a fascinating history - in the 70s it was facing a serious risk of deforestation when a group of young communist students barricaded themselves in the park's caves blocking the Thai army and the farmers to take control of the park. 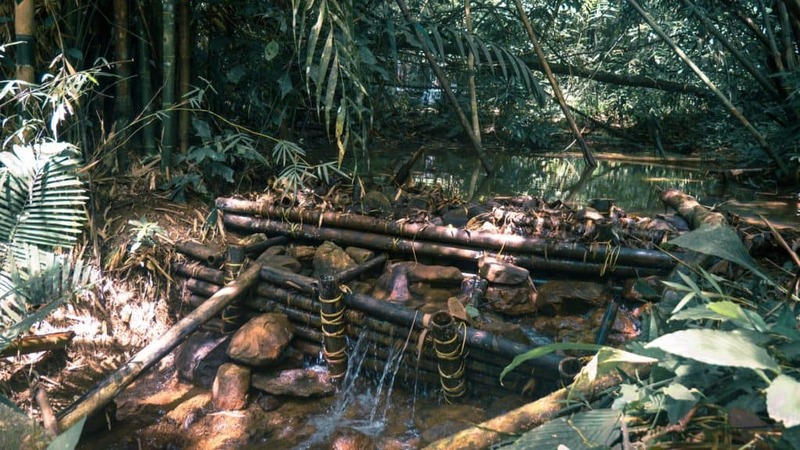 Since 1980 Thai government is on the mission to protect this natural resource. Khao Sok National Park lake is (still) one of the less touristy places in Thailand. It's hard to believe, but yes, Cheow Lan lake is actually man-made. 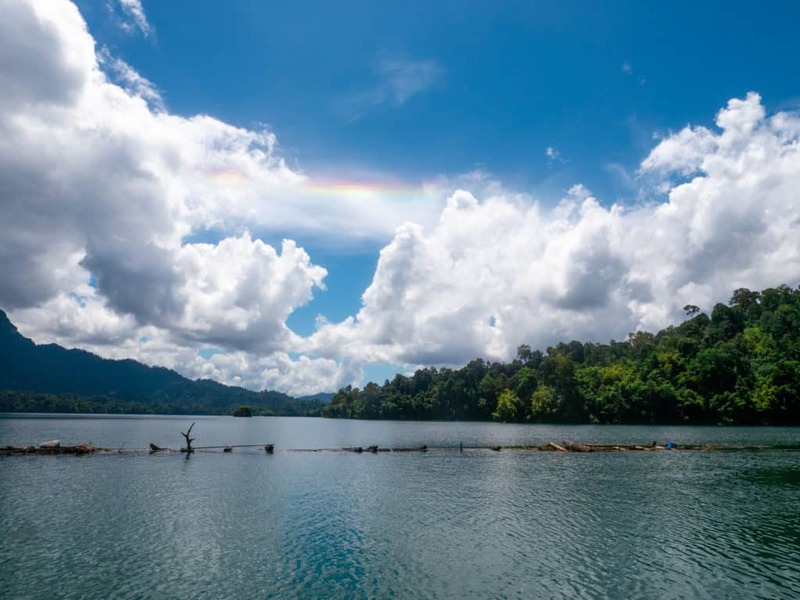 The lake appeared as a result of construction of the controversial Rajjaprabha Dam in 1982, just two years after Khao Sok was granted a National Park status. 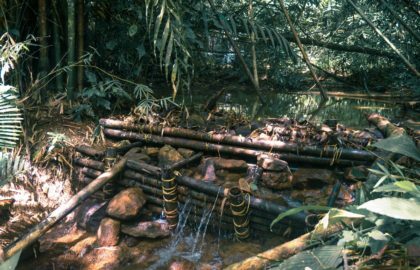 Although the dam is now a significant source of electricity for the increasingly popular South of Thailand, an unacceptably large amount of species died in the process of its building. Located between the Andaman and Gulf coasts, you can easily reach the park by flying to either Surat Thani (URT) or Krabi (KBV) airports and then getting a bus to the national park. Minivans are organized from bigger touristy towns in the area. You can find and book the best fitting route on 12 GO Asia. For more details about possible transportation see the official website of Khao Sok National Park. There are two main hubs within the park - the jungle and the lake. If you opt for spending some time in the jungle, you can go hiking, tubing and wildlife watching, among others. Read about experience doing a one-day hike in the rainforest here. 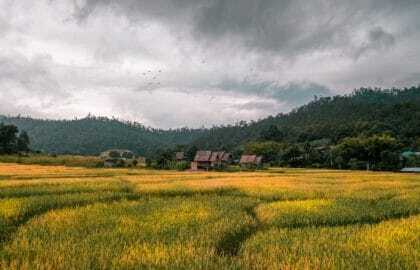 If you decide to explore the area by yourself (on a scooter or a car), you can also enjoy the picturesque road between Khlong Sok village and the lake. 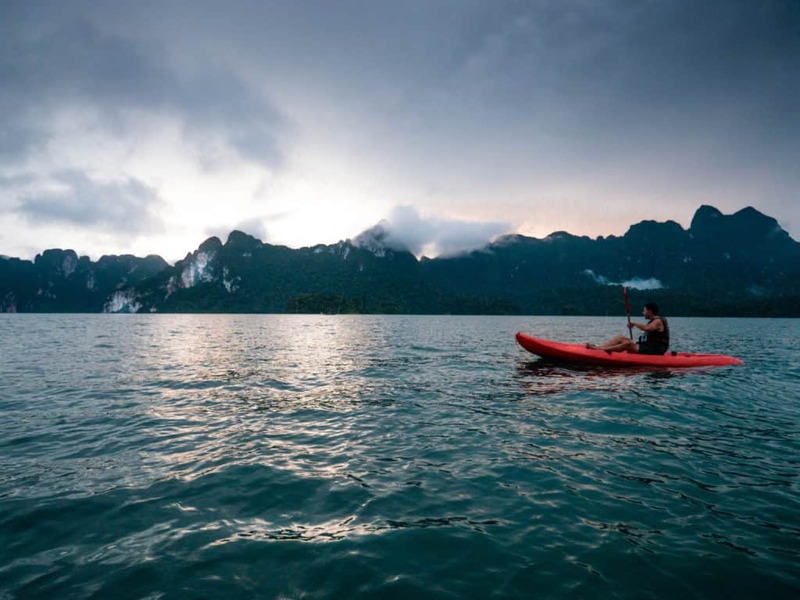 Located between two coasts, Khao Sok National Park gets monsoons from both sides and therefore has the highest level of rainfall in the whole of Thailand. This means there is always a pretty high chance of getting wet when visiting the park. But hey, it's not called a rainforest for nothing 😉 If you want to lower your chances of needing a raincoat, avoid the heaviest rain period between May and November. But keep in mind that you might not be able to see some of the Khao Sok waterfalls if you come in the drier months. Yes, you can but with some restrictions. You are allowed to hike about 3.5 km into the jungle by yourself but are then advised to get a guide to accompany you. The 3.5 hike is a fairly simple one on a well maintained road. The only challenge is going through the side paths to get to the river and waterfalls. When it comes visiting the lake, you can rent a car or scooter to get to the pier and then rent a boat there directly. We opted for going with the tour as we wanted to see more places and do some things we wouldn't be able to do without a local guide. Like, for example, seeing Khao Sok waterfalls. 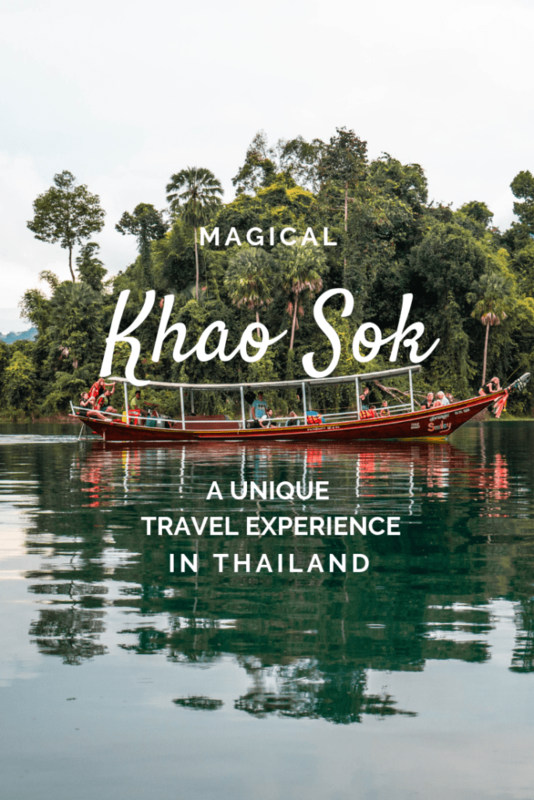 If you are interested in seeing Khao Sok independently, check out the blog post from Once Upon the Journey. The guys had an amazing experience exploring the area by themselves. Probably not more dangerous than any other place on Earth if you don't put yourself in unnecessarily risky situations. Of course, accidents happen everywhere. We did some online research to see if there were any major reported. To our surprise we didn't find much. If there was nothing, it would have been more suspicious, don't you think? Most fatal cases revolved around climbing caves in rainy season. Oops. Another story we found was about a couple facing a cobra in a cave. Nobody died, but the experience wasn't the most pleasant one, as you can imagine. It looks like avoiding caves in Khao Sok is the way to go to stay on the safe side. Here below is an overview of costs we had during this trip. Unless stated otherwise, the costs are per person. 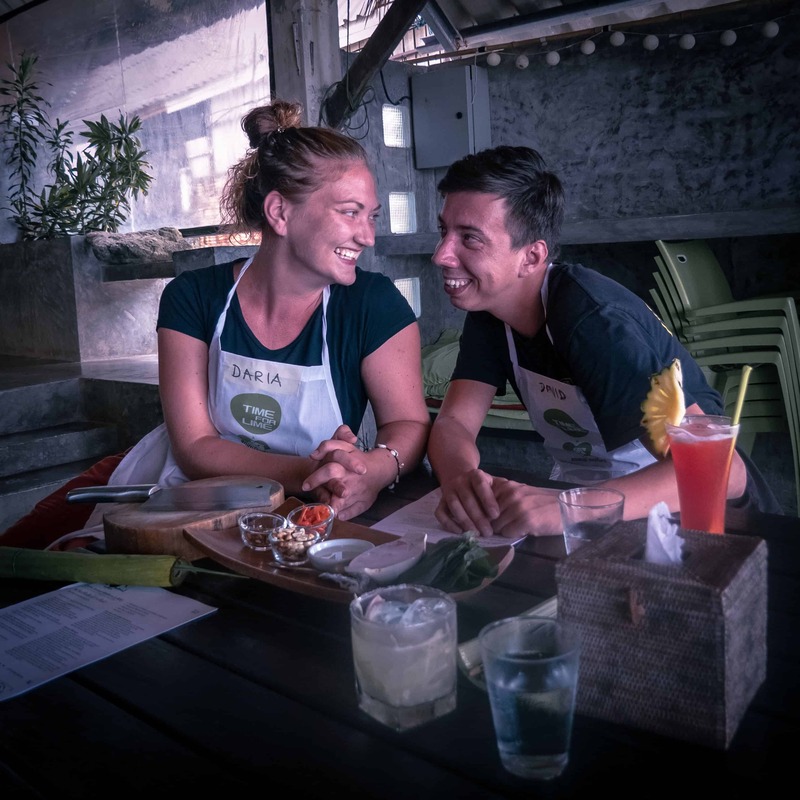 Check out our couple's backpacking travel budget guide to learn more about how we plan our expenses and stay within budget during our journey. WOW !!! awesome article! the only problem is that now I NEED to visit this place and do the things you did! I´m sure you had the greatest time there by the pics and your cool video! I already PIN it to remember next time I visit Thailand! I am afraid of water but your so detailed post is making me to go visit this place. I love your sense of nature and photography. A great helpful post and the most amazing thing for me is, visiting with backpacking. In two years we are going to start travelling with kids. I will keep this in mind. Less luggage makes life easy. With your talk you seem like very pro traveler. So many great tips. Wow! You have a more adventurous spirit than I. I would have stayed on that beach! I love your post. I am the mother of Josh. I am so glad that your paths crossed. I wish you well as you continue to travel. Take care! Thank you, Regena aka Josh’s mom 😍 So happy to meet you! We are also very grateful for having met your son – he’s an amazing human being! I’m absolutely amazed how calm he can remain in the most nerve wrecking situations. That’s impressive! Haha I have a feeling we will share many more adventures together, just hopefully a bit less dramatic next time 😉 Greetings from Vietnam! This was really interesting to read and you are very well written! It was like reading a mystery novel as I didn’t know what was going to happen next. Great story! My son would love to visit this place. I’d be a little overwhelmed but probably enjoy it once I got my bearings. Amazing! I love how informational this piece is, the photos are perfect and everything is described so that you feel like you are there! Cheow Lan Lake must rejuvenated for you. Embracing raw nature and trekking, swimming and roaming in the barren land is just breath taking, also the pictures. Thank you for this super guide for us to visit Thailand. The photographs are absolutely stunning! I enjoyed the commentary that took side tracks into your thought patterns. People who appreciate the rain are good ones. This sounds like an absolutely amazing place! Not sure about sharing water with King Cobra’s but I might be able to get over that with the sights and sounds you describe!